" I really like the new swift FX for her! It is so much better in all ways!! " " Finally I found a mask that works for me. I have a small face and this works great. It is quiet and comfortable, and easy it put on and remove. " Simple by design, the Mirage Swift has been reduced to a sleek, minimal interface that is lightweight and easy to fit. The Swift FX For Her is designed specifically for women and shares the same new features of the Swift FX Nasal Pillow Mask. Outfitted with petite size pillows and female-friendly colors, the swift FX should brighten up your beauty sleep. 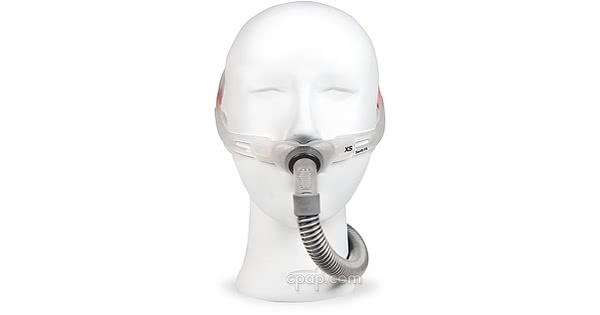 ResMed has made some substantial design changes to accommodate smaller facial features. 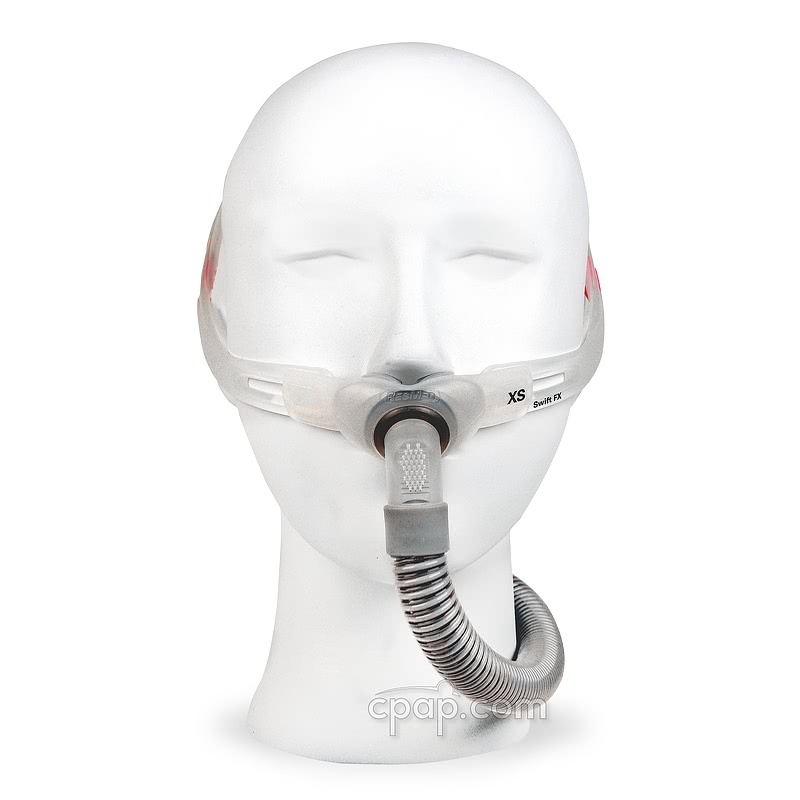 After reviewing female patient performance, the length of the headgear backstrap was altered. The Swift FX For Her makes fitting a cinch, packaging each mask with an Extra Small, Small, and Medium size pillows. Improved Pillows The nasal pillows are designed with dual-wall flaps with improved support and comfort. The cushion's base is outfitted with an integrated flexible chamber that provides stability for side sleepers. This added flexibility accommodates movement and a reliable seal at high therapy pressures. The Swift FX has been tested up to 20cm of water pressure and can maintain a consistent seal even at maximum therapy. Headgear Leading in innovation, ResMed introduces a soft, silicone-based headgear that cradles your face. Made from similar, silicone material found in cushions and pillows, the Swift FX headgear lightly rests on the user's cheeks and quickly feels like nothing is there at all. 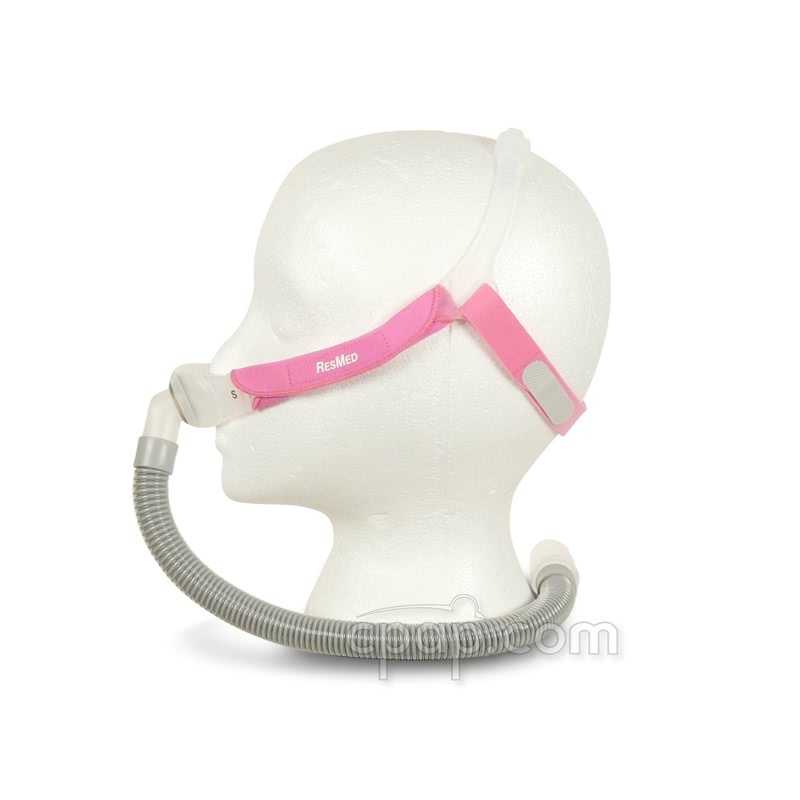 This streamline design helps foster a sense of freedom and promotes early CPAP acceptance. Easy Fitting The minimal design is simple to use, with only 2 points to adjust: A low-profile backstrap and buckle on top. The backstrap is a Lycra-based material with Velcro fasteners. The top buckle is incorporated into the headgear and uses a set of notches for easy adjustment. The Swift FX headgear received three additional buckle notches that allow users to tighten around smaller heads. The adjustable backstrap was also shortened and can be worn under a pony tail, accommodating a wide range of hair styles. The Swift FX comes with Extra Small, Small, and Medium size pillows included with a Large size sold separately. All pillow sizes are interchangeable with the mask frame. Important Note: Per the manufacturer of the Swift FX For Her Nasal Pillow, the short tube assembly of the Swift FX Nasal Pillow (elbow, short tube, and swivel) is NOT interchangeable with the Short Tube Assembly for Swift™ FX Nano. Although the two products appear similar there are differences between the two products. Swift FX For Her Headgear Size: The elastic backstrap used with the Swift FX for Her measures 15 inches long (not including tabs). The tabs add 2.5 inches to the overall length of the elastic backstrap. The width of the backstrap is 3/4 inches for both. The silicone portions of the headgear are the same for the Swift FX and the Swift FX for Her.